A Multi Split System is an air conditioning system where multiple indoor units can be operated from the one compressor. A Single System is an air conditioning system where there is one indoor unit combined with one outdoor unit. What is the cost difference between Multi split systems and Single systems? The total cost of the indoor units plus the cost of the multi outdoor units is higher than the total cost of the single units. What are the applications for Multi Split Systems? Entire house air conditioning in the case where there is insufficient roof space for a ducted system. Townhouses and units where the body corporate allows e.g. only one unit on a balcony. High profile areas where multiple outdoors units are not aesthetically pleasing. Yes. If the multi outdoor unit fails then all the rooms serviced by that multi lose the air-conditioning. 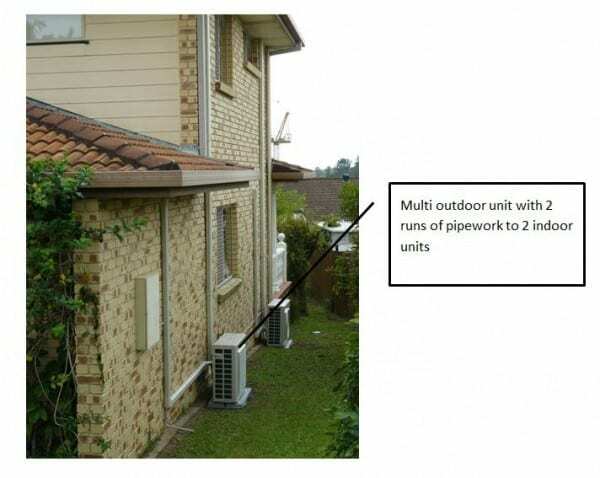 In the case of a single outdoor faulty unit then only one room loses the air conditioning. Multi Split Systems provide better aesthetics and a solution for restricted outdoor areas. Single Systems cost less and provide greater flexibility if one outdoor unit fails. Get in touch with Crown Power for more expert advice on air conditioning for your home or commercial property.